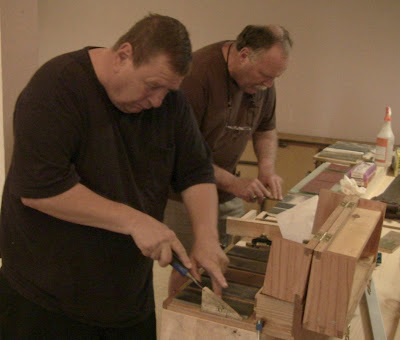 Ray Perrault sharpening a chisel on the oilstones while Gary Morrison flattens a back. 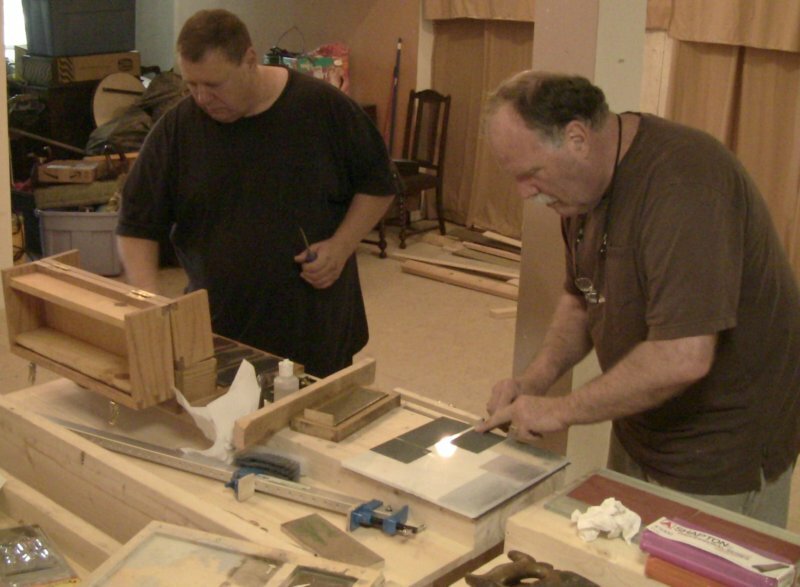 Yesterday was the first class of the 2013 Close Grain School of Woodworking season. The topic was sharpening, what Mike Dunbar calls the gateway skill. With sharp tools, hand tool work is a joy. I had two students, Ray Perrault and Gary Morrison. Gary is a professional home remodeler who saw my booth at the New England Home Show. While he's experienced doing remodeling work with power tools, he's interested in learning furniture making techniques using hand tools. I had multiple edge sharpening setups available for them to try: Norton oilstones in my portable sharpening station, Norton waterstones, Ohishi waterstones, DMT Duo-Sharp diamond plates, sandpaper, and hand-cranked grinding wheel. Gary had brand-new Shapton waterstones with him, so the Ohishi stones were good for him to use. I talked about bevel angles, bevel profiles, and sharpening motions. I like to show multiple ways of handling the tool because of the variety of tool shapes, from long, short, wide, and skinny. A method that works well with some tools can be awkward with others. I made one important change to the class that worked out very well. I've always talked about the need to flatten the back of a tool, but never went into detailed procedure. This time I did. I was very happy with the way my tools had turned out during final preparation for the Home Show when I used the sandpaper method in Chris Gochnour's article, "Plane blades and chisels need a flat and polished back" from the April 2013 issue of Fine Woodworking, #232. For the class, I used a similar setup. For the flat substrate, I used a 12"-square polished marble floor tile I bought at the home center. This is inexpensive and more portable than the piece of tempered glass bathroom shelving I use at home, or my heavy marble reference plate. It's good and flat, though I assume not to the flatness tolerance of the reference plate. I adhered 6 pieces of sandpaper to the tile with spray adhesive. The grits were Norton 3X paper in 60, 150, and 400, and Klingspor wet-dry automotive paper in 600, 1000, and 1500. Gochnour has slightly different grits in his article, going to 2000. The 60 may be coarser than necessary for new tools, but is good as the first grit for restoring old tools. There's room for an additional intermediate grit as well. The flattening process is to alternately rub the last inch or so of the back of the tool in side-to-side and forward-and-back motions on each successive grit. When the scratch pattern in the new direction replaces the last one, you know you've done enough. By the time you've reached the final grit, you have a mirror surface on the tool. It just takes a few minutes. Any out-of-flat areas or other defects stand out quickly. 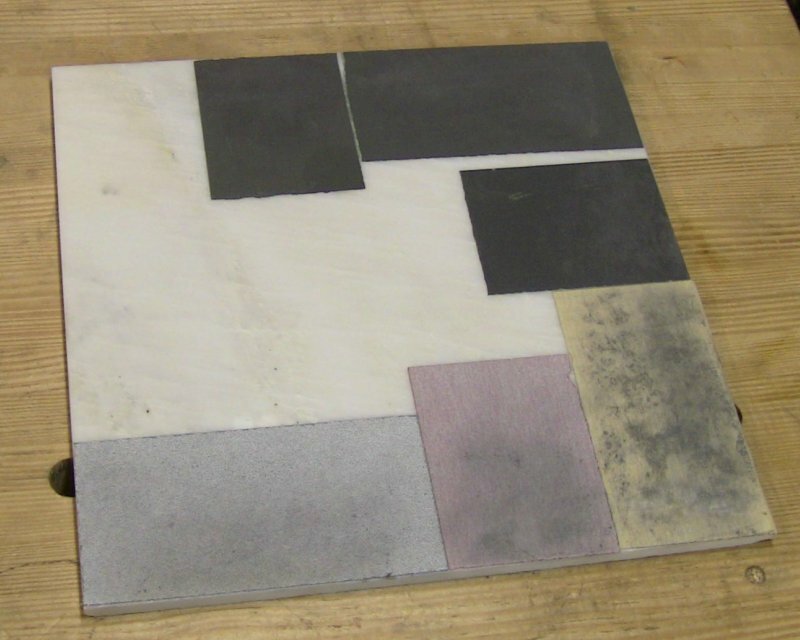 A square of polished marble floor tile with pieces of sandpaper arranged for side-to-side (long pieces) and forward-and-back (short pieces) motions. I arranged the papers in 3"x6" and 3"x4" pieces around the edge of the tile. Resting on a piece of non-slip shelf-liner to hold it in place, you simply rotate the tile to the next side as you progress through them. So why was this important? After I demonstrated the process of flattening and sharpening, Ray and Gary went to work on their chisels. Ray had brought some from home, and Gary had a set of the cheap home center chisels I recommend for practice. Ray used the flattening setup first, then sharpened the bevel freehand on the oilstones. The payoff came when he tested the edge on a piece of pine end grain. I could hear the schuss of it paring off a fine end grain shaving. He just busted out laughing. That was a sharp chisel. I had him clamp the scrap longwise in the vise and then take the corner off with the chisel. The result was equally satisfactory. The cut surface was smooth as glass, almost as shiny as the polished marble. Gary used the flattening setup on his chisel, removing the heavy swirled machine marks from the back, and sharpened it on the Ohishi waterstones. Then came his moment of truth. Just like Ray's, it took a fine end grain shaving and left a glassy surface when slicing along the grain. So the extra emphasis on polishing the back using a simple and effective method was worthwhile. Ray and Gary both had big grins on their faces when they saw what they could do. For me as an instructor, that's a sign of success. If you'd like to learn this or other hand tool skills, check out the schedule at Close Grain School of Woodworking for either group or private classes.